The political wing of Hamas should be proscribed as a terrorist organization like its military wing, a Labour Friends of Israel (LFI) official has said. His comments come as charities criticized the UK government’s Gaza aid policy. Michael McCann MP, vice chair of LFI, made the suggestion at a Westminster Hall debate Wednesday about Britain’s contribution to preventing further conflicts in Gaza. His comments come amid an outcry that the UK government is trying to link the reconstruction of Gaza with its demilitarization. He argued the government should “assess the increasing evidence that Hamas’ political and military wings are contrapuntally linked,” he said, and push for the addition of the political wing to the list of prohibited terror organizations. Britain should also use its position on the UN Security Council to place sanctions on countries which aim to transfer weapons to the terror group, McCann said. Ellwood said the country would continue to lobby for the loosening of restrictions on goods transfers and the movement of people in and out of Gaza, and urged the EU to assist with the construction of a port in Gaza to increase trade. The possibility of the international community overseeing the destruction of weaponry in Gaza was also raised in the debate. This suggestion has been heavily criticized by NGOs who strongly oppose attempts to link demilitarization with reconstruction in Gaza, which was heavily bombed during the conflict with Israel last summer, killing 2,000 Gazan civilians, including many women, children and the elderly. The United Nations Relief and Works Agency (UNRWA) said Wednesday the region was in dire need of funds for reconstruction, and that countries that tried to link aid to demilitarization were in danger of enforcing collective punishment on Palestinians. UNRWA spokesperson Chris Gunness said children in the region had frozen to death over the winter, with parents and grandparents blaming the deaths on lack of donations. “The international donor community killed those babies,” he reports one grandfather as saying. “The UN has always condemned rocket fire but collective punishment is illegal. You can't punish freezing children because of the actions of armed groups,” he said. 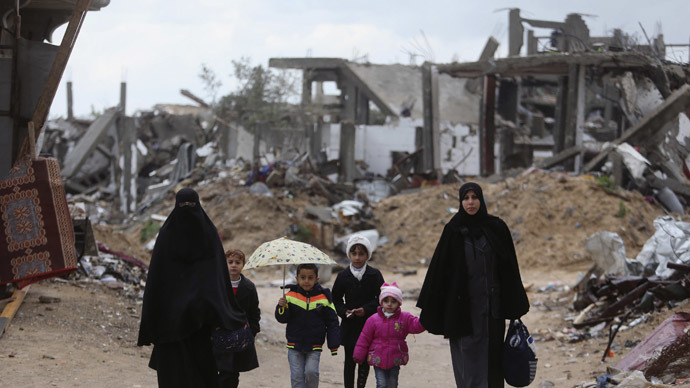 “The situation is so desperate in Gaza and what we need right now is money for reconstruction,” he added. International charity Oxfam is also firmly in favor of opening up Gaza for aid and international donations.